Beware dragons, mermaids and living mazes! Harry Potter has arrived in his triwizard gear. 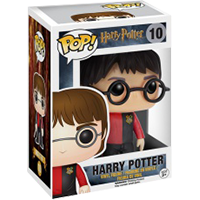 This 9.5cm figure arrives in its own windowed box and proudly represents the colours of his house in the triwizard tournament. Comes armed with wand and glasses. The Triwizard Tournament is a magical contest held between the three largest wizarding schools of Europe: Hogwarts School of Witchcraft and Wizardry, Durmstrang Institute, and Beauxbatons Academy of Magic, each school being represented by one Champion. Selected Champions compete in three tasks — traditionally judged by the Headmasters or Headmistresses of the competing schools — designed to test magical ability, intelligence and courage. Champions compete for the honour and glory of winning the Tournament, for the Triwizard Cup, and a monetary prize. The first Tournament was held in sometime in the late 12th or 13th century. It was renowed for being extremely dangerous, even lethal! In 1994, the Tournament was revived with restrictions in place in an attempt to stop potential deaths. One of these restrictions was that all applicants had to be of the Wizarding Age of Majority (which is 17), or else they would not be allowed to apply to be Champion. The 1994 Triwizard Tournament is famous for having had four competing Champions, including Harry Potter, and for also having ended in tragedy with the death of Cedric Diggory and for the Rebirth of Lord Voldemort.